Aculon® NanoClear® Test Pen technology enables a simple and effective test for the proper application of Aculon® NanoClear® stencil treatment. Now available direct from Aculon®! Do not touch or contaminate surface prior to testing. Contaminated surfaces will not give accurate results. Use a “Fresh” test pen. 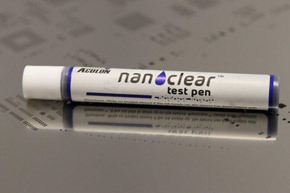 NanoClear® Test pens are good for 6 months from production. Never re-test the same location. Move along the sample or test a new area. Store Aculon® NanoClear® Test Pens at room temperature. Place stencil on clean level surface. Ensure stencil is at room temperature. Draw test pen across stencil surface to be tested. Make three passes, each 6-12 cm in length, evaluating the third pass only. See below for how to interpret results. Clean the test area with IPA or DI water and a clean room wipe prior to using stencil. If the third ink swath beads up, tears apart, or shrinks into a thin line then this surface has the Aculon® NanoClear® fluxophobic coating on the surface.